St. Patrick’s Day is a big one in our house. I admit to slacking off a little bit… we didn’t do any leprechaun traps or chocolate coins, and since school is out, I didn’t have the impetus of stuff that is normally done in the classroom on which to build. But all was not lost. Mr PugRunner hit the store for some Irish soda bread and dessert and we made plans to go to an Irish pub for a late lunch. I started the day with a run, wearing my new Green Monster tank. It was a good run, and I treated myself at breakfast. Mr PugRunner is VERY particular about corned beef, so our choice of restaurant reflects that. He prefers sliced to shredded, to such a degree that when we go to the Irish pub closest to our house to celebrate March 17, we have to go out AGAIN to get it again, because theirs is served shredded. Corned beef is one of those few things I find pretty awful, so I just won’t cook it. We decided to go to Fionn MacCool’s in downtown. Mr PugRunner could have his sliced corned beef, as well as live music, and the rest of us were happy to spend some time together. The restaurant serves an all-you-can-eat Corned Beef Buffet on St. Patrick’s Day (corned beef, cabbage, potatoes, soda bread and rye bread), as well as a limited menu for those who prefer something else. The food is always good and even though it was super crowded, the service was fantastic. I loved Bud Light’s festive aluminum beer bottle. And I was incredibly happy with my fish and chips. Little man made good friends with the server. Even though she was crazy busy, made a big fuss over his Pokemon cards, and brought him a special shamrock cookie. And Papa Bear and little man just had fun messing around. After enjoying the music and the meal, we took a little walk along the waterfront. Nice that I don’t have to worry about running that bridge for another year! We couldn’t have asked for a more lovely day. Corned beef: yay or nay? Haha I love how into St. Patrick’s Day you are! When I lived at home we always celebrated with a great meal. Your reference to leprechaun traps brought me back to a very vivid kindergarten memory haha. I’ve actually never had corned beef but really want to try it, it’s been on my list for months now! I must say, sliced certainly sounds better. Definitely try it. For some reason, the smell gets to me. When Mr PugRunner cooks it, I make him take the crockpot outside. I’m awesome like that. I want to hear your kindergarten memory! What a fun day! I like corned beef on a sandwich, but I can’t eat it as an entree. Love Little Man all done up. 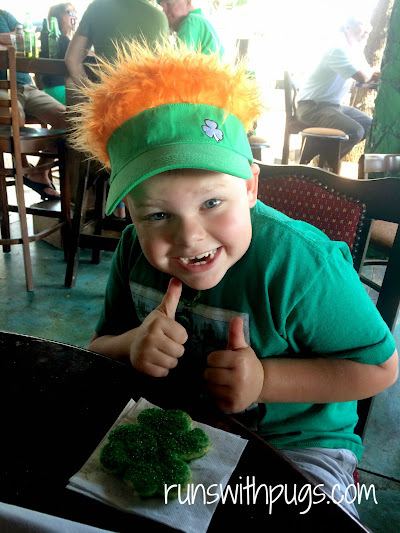 St. Patty’s day is always fun and looks like you had a great time! My hubby loves corned beef and cabbage too and I am a big no! We have a cute wine bar and Irish pub right next to each other and they threw a party and Had a coupe of food trucks show up so I could have some fish and the hubby is still talking about how good his corned beef was! Mary Beth Jackson recently posted…Enjoy the journey………. We are absolutely on the same page! Glad you were able to get your fish!